Morgan James Publishing, 9781683500230, 222pp. 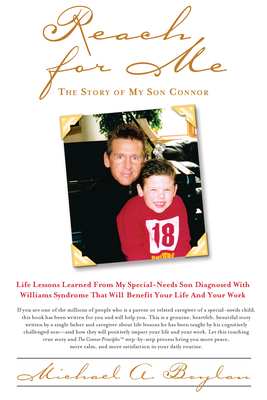 The highly anticipated fourth book from best-selling author Michael A. Boylan, Reach For Me, The Story of My Son Connor, is the inspirational true story of how his life changed abruptly upon receiving the news of his son's diagnosis of William's Syndrome, leading to the collapse of his marriage and family, the loss of his home, his business and life as he knew it, and the healing principles which are woven into a step-by-step process designed to help caregivers address and more effectively deal with all that comes at them over a lifetime of caregiving. Reach For Me is a powerful story of honesty, hope, determination, letting go and finding a deeper resiliency that all will be well, and that all caregivers have a unique need to be embraced and respected by the communities around them. Reach For Me, The Story of My Son Connor is also being compared to the international bestseller The Purpose Driven Life by Rick Warren because of its ability to generate discussion amongst caregivers wishing to address real-world challenges through the step-by-step process with other caregivers and their families. As the best-selling author of three books focused to assist business professionals in becoming more productive (The Power To Get In by St. Martin's Press, TEETH, Does Your Value Proposition Have Any? by Forward Publishing Group, and Accelerants by Penguin Group/Portfolio) Michael A. Boylan has had a successful career spanning over 20 years in the development and writing about best-in-class, step-by-step, productivity-enhancing processes which Fortune 500 organizations have embraced and adopted for their business professionals because the content has produced measurable results for the employees and their employer organizations. Appearing on CNN, CNN-FN, Bloomberg Financial, ABC News, Fox and Friends, and other network television interviews, and being awarded one of the highest-rated keynote speakers Microsoft Corporation has ever hired to address over 6,000 attendees at its largest global event, World Fusion, Michael's highly anticipated fourth book, Reach For Me, The Story of My Son Connor, is destined to positively impact the lives of the more than 35 million parents, families and related caregivers of special-needs children in the U.S. alone. With a 20-year track record of developing step-by-step processes that have helped people enhance their lives, and as the single father of a special-needs child himself, Michael has set forth to help the millions of parents and families of special-needs children of any diagnosis via the step-by-step process known as The Connor Principles, to help caregivers better manage all the hills and valleys that will come at them over a lifetime of caregiving.